Photo courtesy of Steve Barto. A group of students, faculty and community members were led on a journey through the underworld on Friday night at UC Santa Cruz. They met characters dressed in many styles across different eras ranging from a World War II fighter pilot to a seductress in red leather and even a cowboy. Around 40 people gathered at the main stage theater in the art department at UCSC for the opening night of “The Odyssey” hosted by Digital Arts and New Media (DANM), an interdisciplinary program at UCSC that explores digital arts and cultures with emerging technologies and artistic innovation. The night’s production captured different cultures and identities that came together in conversation. To put a fresh spin on the classic narrative, characters were re-imagined and reinterpreted — representations of men and women, foreign people and lands deconstructed binary constraints. 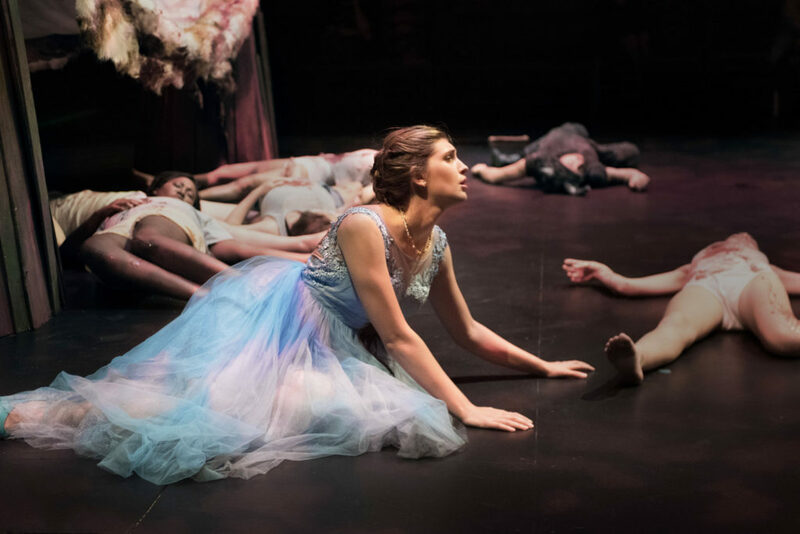 UCSC theater arts department professor and show director Kimberly Jannarone was inspired to create the production after she began seeing themes from “The Odyssey” parallel her own life — themes surrounding war and violence, love and loss. Jannarone also reflected on trying to get home on Highway 17, relating it back to Odysseus heading home from the Trojan War. The original Greek epic poem, written by Homer 2,000 years ago, is a compilation of Odysseus’ journey back to his family in Ithaca. In the production, both student and professional performers were challenged to re-imagine their characters from the original descriptions in the text. Based on what they saw in the show, the audience was also encouraged to reflect on these interpretations in their own way, to weigh in on what it means to be a hero and to consider how fluidity or gender binary shapes identity. Performers led the audience through three separate venues, beginning with a traditional setup of an audience watching a stage and continuing on to the Digital Arts Research Center (DARC). Following their designated leader through the dark by the light of a lantern, the audience explored different rooms representative of the settings in the epic poem. As the audience explored the DARC, they met a character, Antinous, who announced that Ithaca should be “made great again.” While pulling several women aside, he made stereotypical remarks about belonging at home or in secretarial roles to be suited for his city of Ithaca. As the audience was led back to their seats, viewers were left to consider questions of politics and identity, representation and how these roles fit into the modern age. One of the central female characters is Odysseus’ wife, Penelope, who waits faithfully for her husband to return. To expand on her character, Jannarone chose to have two separate actors portray her. The contrast of both young and old characters allowed the viewer to visually contrast the different conceptions of femininity. “We give these two different versions as a way to show who she is in Odysseus’ mind –– he doesn’t know the Penelope that he’s going to come home to,” Jannarone said. 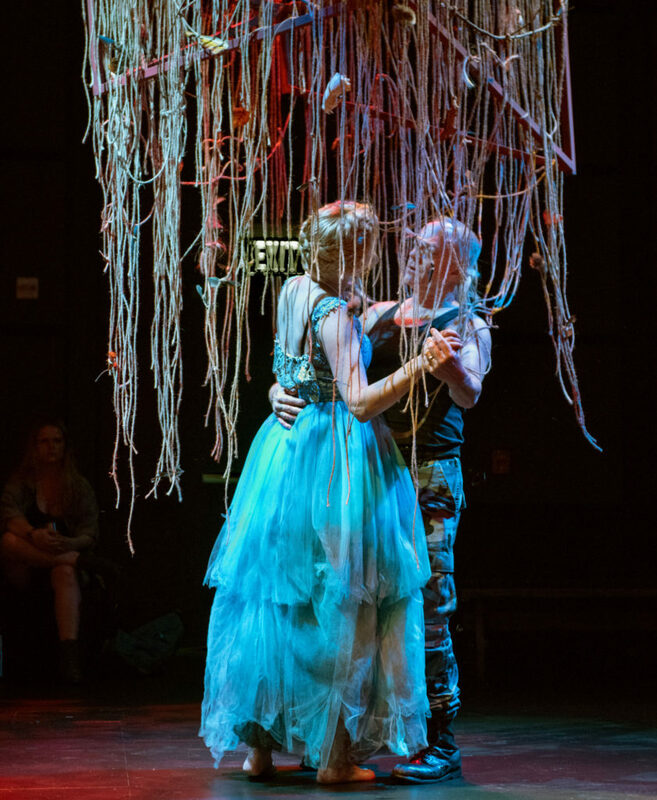 UCSC student Magda Travis, who played one of the guides in the role of Tiresias, was interested in exploring gender roles and ideals in her interpretation of the transgender, blind prophet Tiresias. In her interpretation, Travis said she wanted to remove herself from both the male and female gender types in her portrayal of the character. Travis’ desire to abstain from fitting into either sphere of gender was an effort felt by many participants in their interpretations of the given roles, from a pressure to uphold their character’s assumed integrity. The legacy of Odysseus and the ability to garner positions of power is deeply gendered, Oertel said. When the characters and viewers are confronted with the aftermath of their “hero” Odysseus’ journey in the end, everyone must consider what the role of a “hero” really means.